Thirty years ago this week, the Daily Press sports pages were abuzz with news of a first for the Artesia High School golf program: A clean sweep of the Artesia Invitational Tournament. Both the Bulldogs and Lady Bulldogs, as well as the squads’ No. 1 individual golfers, had topped their respective fields at the Artesia Country Club, a milestone in the sport’s history at AHS. As fate sometimes has it, history repeated itself Monday at the ACC. The ‘Dogs and Lady ‘Dogs duplicated the feat with first-place team finishes and individual wins from Parker Sanders and Josey Jackson, then went on to a near sweep of the Eddy County Challenge, as well. 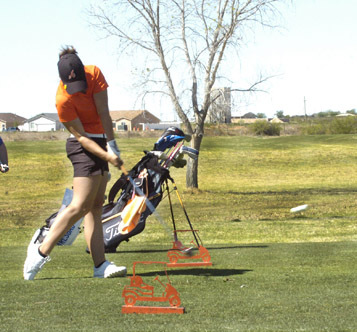 The Artesia girls won the Carlsbad Invitational Tuesday at Lake Carlsbad, as well as the two-day event, going away, while the boys – who tied with the Class 6A Cavemen Monday in Artesia – came up short of them 312-319 Tuesday for a runner-up finish in the Challenge. “These were just two fantastic tournaments,” Artesia head coach Dusty Bean said today. “The girls’ scores the last two days were phenomenal, and the boys got second but to a 6A team. As has become their trend, the Lady Bulldogs bested their closest competition Monday at the ACC – Class 6A Hobbs – by 61 shots en route to the title with a team 325, their fifth state-qualifying score in as many outings. Jackson claimed the individual medal with a round of 75, followed by Brehnan Davis in second overall (76) and Taysea Powell in third (80). That trio, along with Teagan Archer (94) also earned individual states legs – Jackson, Davis and Powell’s fifth and Archer’s second – while BriLe Ybarra rounded out the squad with a 97. Morgan Atkins posted a 113 golfing individually. The ‘Dogs, meanwhile, tied the Cavemen in Artesia with a team 311, punching their state-tournament ticket with their third and final team leg. Sanders’ first-place 71 was also the junior’s fourth individual leg, and Jake Craft logged his qualifying third with a 76. Wesley Davis shot a round of 80 on the day, Tanner Parker an 84, and Canon Carter a 95. Golfing individually for the ‘Dogs were Giovanni Huitron (78), Clay Houghtaling (88), Jake Nelson (91), Cass Carter (94) and Hector Flores (96). Tuesday at Lake Carlsbad, the Lady ‘Dogs remained consistent, repeating their Day One score of 325 for a top finish, a sixth state leg, and an Eddy County Challenge sweep, 60 shots ahead of runner-up Hobbs. 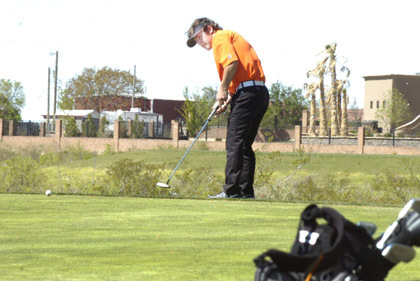 Artesia’s top three again reigned individually, as well, with Powell shooting a 74, Jackson a 76, and Davis an 86. Jackson’s two-day total of 151 earned her first in the Challenge, while Powell took second with a 154 and Davis third with a 162. Those scores and Archer’s 89 were also good enough for additional legs – including Archer’s third – and Ybarra finished the day with a 101. On the boys’ side, the ‘Dogs were seven shots over first-place Carlsbad with a 319 on the day, their fourth team-qualifying score. Craft led the way with a 76, followed by Sanders (79), Parker (81), Davis (83) and Huitron (87). Sanders’ two-day 150 tied him for third individually in the Challenge. Competing individually, Canon Carter posted an 88 in Carlsbad. Of added note, the Lady Bulldogs’ team rounds of 325 Monday and Tuesday currently stand as the top qualifying scores in the state, regardless of classification. The closest to those marks was a 340 shot Oct. 24, 2016, by St. Pius at the Albuquerque Country Club. “So that’s pretty impressive,” understated Bean. The ‘Dogs are also one of just three teams in Class 5A – along with Farmington and Los Alamos – to have qualified for state to this point. “And what’s crazy about all that is we still haven’t played our best golf,” said Bean. “Some individuals have played really good golf for themselves. Teagan shot an 89 in Carlsbad, and for her, that’s a really good score. Parker shooting a 71 in Artesia was a really good score for Parker. But as a team, we haven’t all gone out and shot our best scores yet. The AHS teams will now have an 11-day break before resuming their regular-season schedule April 17-18 at the Roswell Spring Classic. They’ll head to Lovington April 25 for the Black Murphy, then to Hobbs April 26 before competing at the District 4-AAAAA Tournament May 1 at NMMI. “They have PARCC testing coming up, and we don’t travel during that,” said Bean. “That means another week off to prepare, which I think is beautiful, and then we just have four tournaments left before state. We’ll go up the 14th, that Good Friday, to play The Canyon Club (the site of the state tournament in Albuquerque) to get our sights on that, and from here on out, it’s focusing on the little things – focusing on state, our grades, our attendance in school. And then we’ll go try to bring home two state championships.